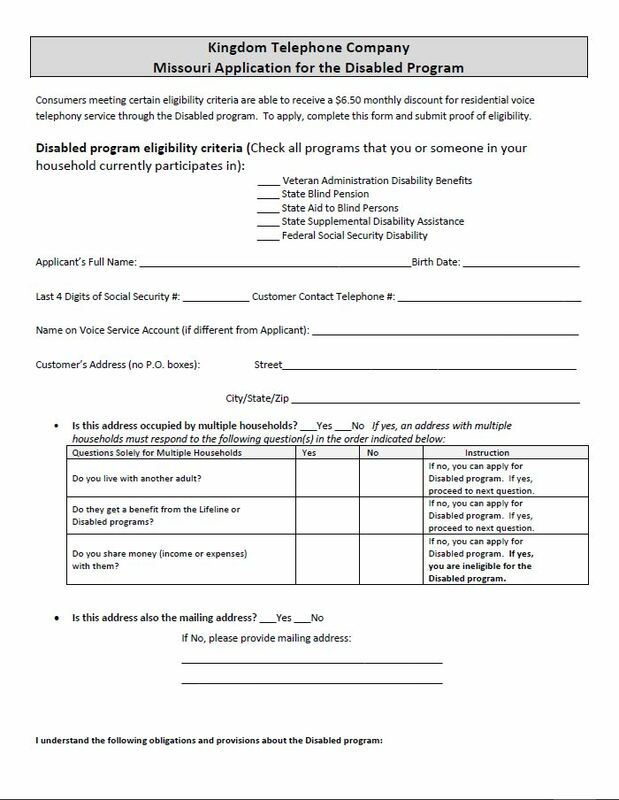 Consumers meeting certain eligibility criteria are able to receive monthly discounts for telecommunications service through the Lifeline Program or the Disabled Program. 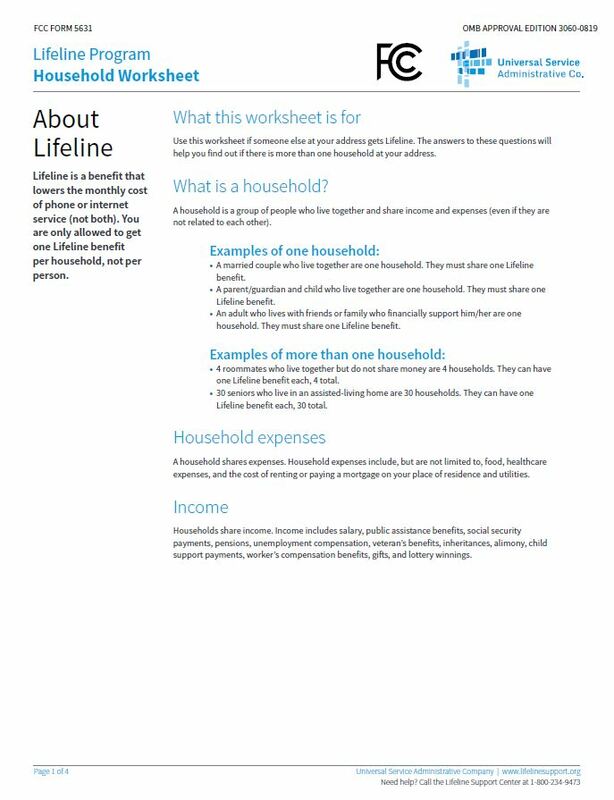 Lifeline service offers a monthly federal discount of $9.25 (for Voice or a service bundle of Voice and Broadband) and state discount of $6.50 (for Voice) for a total monthly discount of up to $15.75. The Disabled Program offers a $6.50 (Voice) monthly discount. To apply, complete the Lifeline Application and also submit proof of eligibility in one of the following programs. Qualifying consumers will receive this assistance on the following services: voice grade access to the public switched network; single-party service; access to emergency services; access to operator services; access to inter-exchange service; access to directory assistance; bundled service plans combining voice and broadband or packages including optional calling features; and voluntary total toll blocking, which prevents the placement of any long-distance calls. Carriers, like Kingdom Telephone Company, providing Lifeline may not collect a service deposit in order to initiate Lifeline services if the qualifying low-income or disabled consumer voluntarily elects toll blocking. Only one Lifeline or Disabled service is available per household. 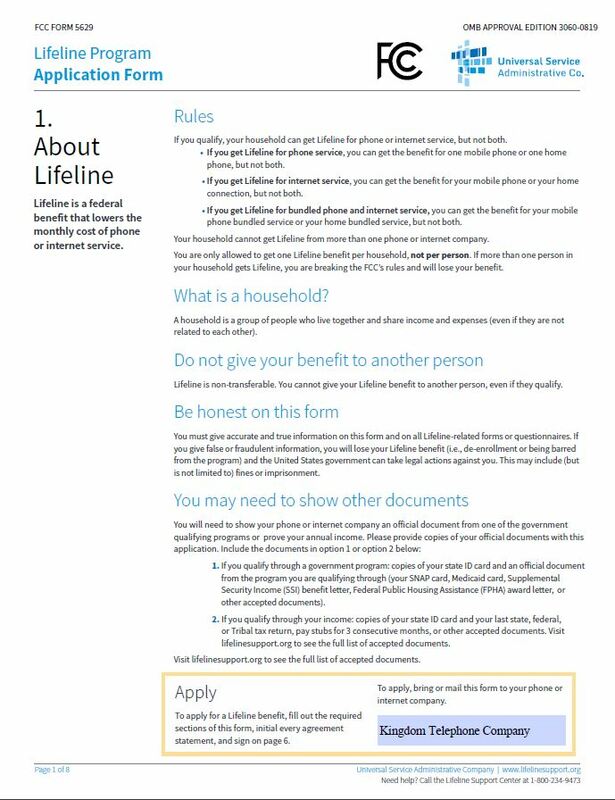 Lifeline and the Disabled program are non-transferable benefits and the subscriber may not transfer his or her benefit to any other person, even if he or she is eligible. The FCC will also require that all current Lifeline recipients be “re-certified” annually. Consumers who willfully make false statements in order to obtain program benefits can be punished with a fine or imprisonment or barred from the program. For additional details you can call our Business office at 1-800-487-4811 or visit https://www.lifelinesupport.org/ls/. The completed form(s) may be brought to our office or faxed to us at 573-386-5520. You may also email us at customerservice@kingdomtelco.com.